EarthBound is the only game in Shigesato Itoi’s MOTHER series to be released outside of Japan, with this installment being the second title in the series. After a difficult, problem ridden development cycle, MOTHER 2 finally came out for the Super Famicom in 1994, five years after MOTHER. The US version, EarthBound, came out for the Super NES a few months later in 1995. 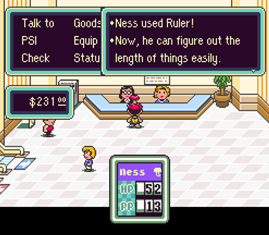 Everything about MOTHER was made bigger, and better for EarthBound. 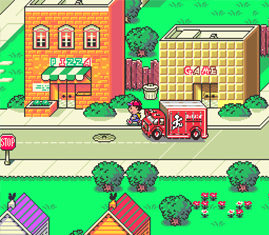 MOTHER 2’s graphics were vastly improved, the contemporary towns and cities populated with more characters to talk to and the streets made busy with vehicular traffic. EarthBound’s world was even more expansive than MOTHER’s, and was once again true to scale. At a whopping 600 pages, EarthBound’s script was about six times the length of MOTHERs, which allowed for a deeper, more flushed out storyline, and more complex dialogue, making MOTHER seem barren and lonely in comparison. 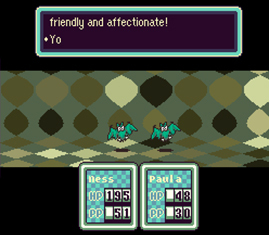 Despite EarthBound’s humorous, upbeat mood and colorful graphics, players encounter unexpectedly meaningful and emotional situations that they may not not have expected from a game that the uninitiated sometimes mistake for a Pokemon title. EarthBound’s soundtrack is also just about perfect given the available technology, and unlike MOTHER’s, which could get repetitive at times, EarthBound plays host to many diverse tracks of such high caliber that some of it could pass for “real” music having nothing to do with a video game. 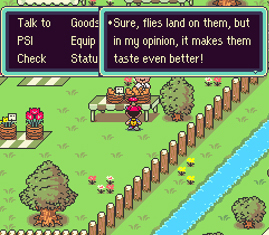 The core of EarthBound’s gameplay, the battle system, has also been greatly improved upon. While many Super NES RPGs had four different battle themes (a regular battle theme, a miniboss theme, a boss theme, and a final boss theme) EarthBound has about nine different battle themes which represent numerous genres including rock, jazz, techno, and ironically enough, chiptune. 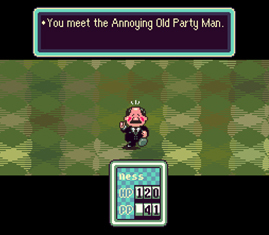 Instead of the static, black backgrounds of MOTHER’s battle screen, EarthBound’s battles are accompanied by pulsating psychedelic light shows fitting to the pace and mood of the often humorous battles against New Age Retro Hippies, Annoying Old Party Men, Psychic Psychos, Mad Ducks. Another improvement is the “rolling health meter”, which essentially means that your health is displayed on odometer reels that have a delay on their rolling action. For example, if your only character has 50 Health remaining, and then takes a blow that deals 500 damage, you can still survive if you can manage to defeat the enemy or use a healing item before the meter actually reaches 0. Later in the game when your characters have hundreds of HP each, this will often mean the difference between life and death. Also, unlike MOTHER, which was often accused of having balance and difficulty issues which demanded long level grinding marathons, EarthBound is pretty well balanced throughout, and gives you enough leeway to level up and upgrade your weapons without having to significantly stall your progress to do so. Despite MOTHER 2’s success in Japan, Nintendo’s attempt to popularize EarthBound in the US failed miserably. 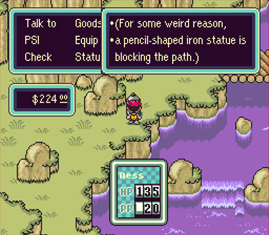 At the time of EarthBound’s 1995 release, the RPG had yet to become as popular in the US as it would be just a few years later. A combination of this, EarthBound’s “cartoony” graphics, and a poorly conceived marketing campaign in which Nintendo of America characterized EarthBound as being full of fart and barf jokes, doomed this game to disappointing sales. Later, a combination of internet word of mouth and the main character Ness’s appearances in the Super Smash Bros. games helped EarthBound (and the entire MOTHER series) gain a considerable cult following. Today, the EarthBound game pack often sells for upwards of $50.00 USD on eBay. Like it’s prequel the unreleased “Earth Bound (NES)”, Nintendo aught to take advantage of all the interest in the EarthBound games and put both titles up for sale on the Virtual Console rather than let ROM hustlers and counterfeit cartridge manufacturers make all the money on an excellent series that Nintendo of America has all too quickly given up on.